Soups are a great supper meals. You can put them in a crock-pot or put them in your favorite dutch oven on your stove top. Either way, they make a great Supper meal for yourself or your guests. I am allergic to jalapenos so this recipe does not include them. You can add them for a garnish on top if you wish. 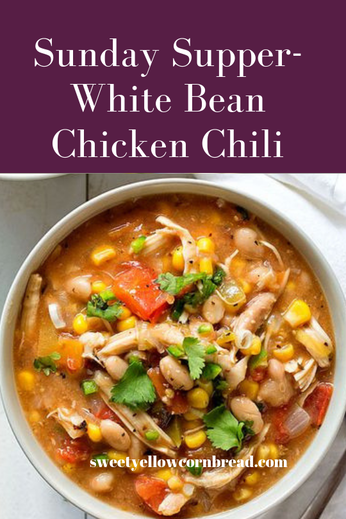 This soup/chicken chili does bring some heat. It is delish and a hearty meal! I borrowed this from our Sunday Supper Recipe Ideas. Be sure and check out the rest of those. P.S. Great Super Bowl Meal! Heat oil over medium heat in a dutch oven or large pot and add onion. Cook for about 5 minutes or until translucent. Stir in broth, salsa verde, corn, tomatoes, and oregano. Add shredded chicken and beans; simmer 5 minutes.